Okinoumi, qui avait vaincu la veille le candidat à la tsuna Kisenosato, a obtenu son troisième kinboshi en sortant Kakuryu. Le yokozuna, peu convaincant depuis dimanche, enchaîne avec une seconde défaite. 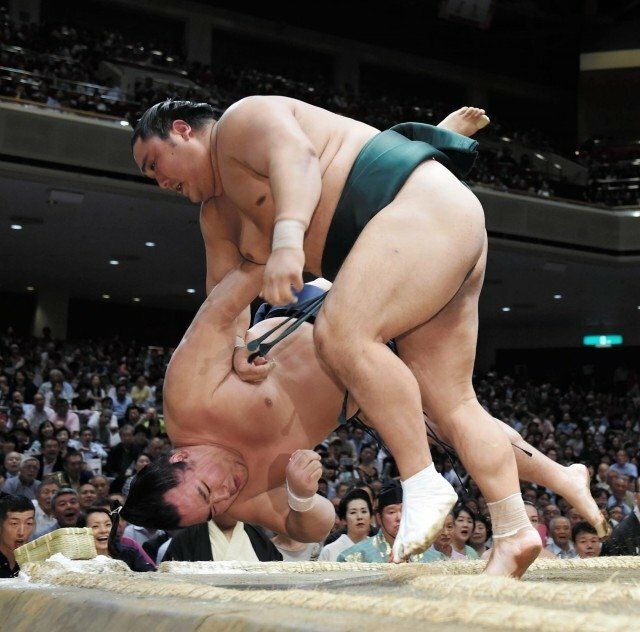 Après une défaite surprise dimanche, Kisenosato est revenu dans la course en trouvant une victoire confortable face au komusubi Tochiozan. Kisenosato a pris sa revanche sur Tochiozan qui l’avait battu en juillet à Nagoya. L’ôzeki a saisi à la gorge son adversaire pour le conduire hors de l’anneau. Harumafuji, qui cherche à obtenir son second titre consécutif, a été mis en danger par Yoshikaze avant de retourner la situation à son avantage. 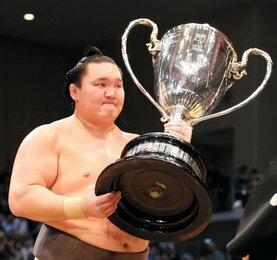 Le yokozuna vainqueur à Nagoya, s’est imposé à l’issue d’un combat explosif avec le maegashira 1. Kotoshogiku se presse d’arriver aux huit victoires nécessaires pour sauver son rang en sortant sans peine le géorgien Tochinoshin. Goeido, également kadoban, était tout aussi efficace pour s’imposer face à Shodai. Gêné par ses blessures aux deux genoux au cours de ces derniers mois, l’ôzeki Terunofuji a remporté son premier match en renversant le komusubi Kaisei. 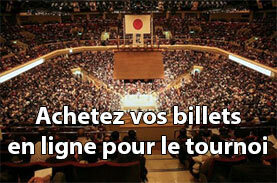 Takayasu a pris le dessus sur Myogiryu après un échange de gifles soutenu pour décrocher sa première victoire en tant que nouveau sekiwake. Takarafuji, également nouveau promu sekiwake, a été dominé par Takanoiwa. Dans les combats précédents, le maegashira 13 Amakaze a rebondi de sa défaite de la veille en battant Endo. Chiyoshoma poursuit ses débuts en makuuchi sur sur un sans faute grâce à sa victoire sur Toyohibiki. Ozeki Kisenosato got his latest bid for promotion to yokozuna back on track with victory over komusubi Tochiozan at the Autumn Grand Sumo Tournament on Monday. 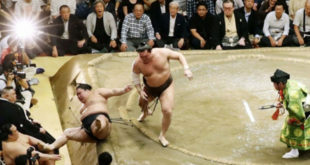 Stunned by top-ranked maegashira Okinoumi on the opening day of the 15-day basho on Sunday, Kisenosato set himself up for a comfortable win at Ryogoku Kokugikan, grabbing Tochiozan (1-1) by the throat before shoving him over the straw ridge. Kisenosato, who gained a measure of revenge for his defeat to Tochiozan at the Nagoya tourney in July, is making his fourth run at promotion to grand champion. He has been charged by the Yokozuna Deliberation Council with seizing an elusive first championship in order to finally reach the top rung of the sumo ladder. That task has possibly eased somewhat in the wake of the injury-enforced withdrawal of Mongolian yokozuna and 37-time title winner Hakuho. In other key bouts, Harumafuji (2-0), who is seeking back-to-back titles after winning the Nagoya meet, got a scare but took out No. 1 maegashira Yoshikaze (1-1) in an explosive encounter. 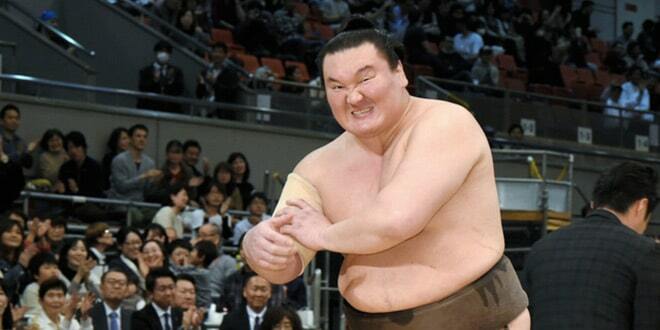 Fellow Mongolian yokozuna Kakuryu, who missed the majority of the Nagoya meet with lower back pain, crashed to a second defeat at the hands of Okinoumi (2-0). Also in the upper ranks, Kotoshogiku, his rank on the line for the sixth time, got the second of eight wins he needs to stay at ozeki for the next tournament in Kyushu in November, bundling out second-ranked Georgian maegashira Tochinoshin. 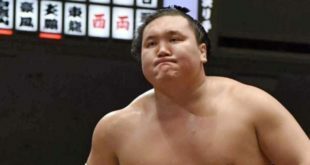 Goeido, another « kadoban » ozeki needing a winning record, was equally imperious in his bout against Shodai, forcing out the second-ranked maegashira to also make it two wins out of two. Hampered by injuries to both knees in recent months, Mongolian ozeki Terunofuji picked up his first win by toppling Brazilian-born komusubi Kaisei (0-2). 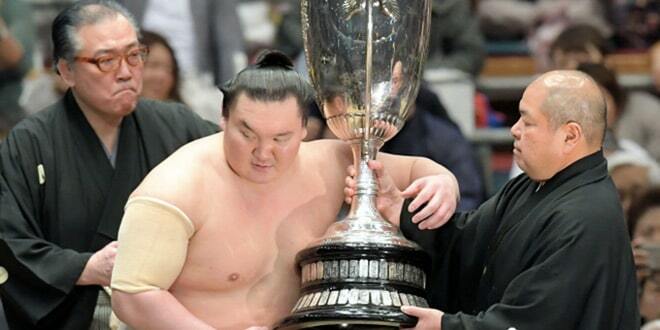 Sekiwake Takayasu prevailed in a slapfest against fourth-ranked maegashira Myogiryu to pick up his first win on his debut at sumo’s third-highest rank, but Takarafuji (0-2), another newly promoted sekiwake, was outmuscled by third-ranked maegashira Takanoiwa (2-0). In earlier bouts, 13th-ranked Amakaze bounced back from his opening-day defeat to fellow makuuchi-division newcomer Chiyoshoma with an oshidashi win over 14th-ranked Endo (1-1). Twelfth-ranked Chiyoshoma (2-0) beat winless No. 13 maegashira Toyohibiki (0-2) with a pulling overarm throw.